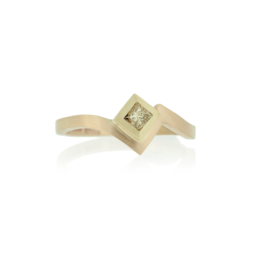 A zig-zag ring with an asymmetrical softened ‘zig’ for a 2.8mm square princess cut champagne diamond. The ring is made from from scratch in 18k rose and yellow Fairtrade Gold. This design can be adapted to suit other gemstones and made from other metals. Choose from a palette of colours in 9k, 14k, 18k and 22k Fairtrade Gold, all of which are all hand-alloyed in the workshop. Recycled Palladium and platinum are also available.